PLOT: In a future where mankind has had to abandon Earth and has found a new home on a colony called Nova Prime, humanity's greatest warrior, Cypher Raige (Will Smith) has just come back from a long tour of duty to be reunited with his son Kitai (Jaden Smith). He takes Kitai with him on a routine training mission, but a deep-space calamity leaves them marooned back on Earth. With both of Cypher's legs broken, it's up to Kitai to find a beacon that will signal their presence. Now, Kitai not only has to navigate the treacherous environment, but he's also being stalked by a dangerous alien from Nova Prime that was on-board the ship when it crashed. REVIEW: That’s not to say this movie is nearly as airtight an endeavor as Sense, because it isn’t. But the loyal Night watchers who were deeply disappointed by his last few forays into moviemaking, The Happening and The Last Airbender, will find enough to enjoy once they accept After Earth for what it is: a subdued, small survival story with a calculated family hook that softens the sci-fi so it can aim at young adults and their parents. The clues to this film’s intentions are blatent. 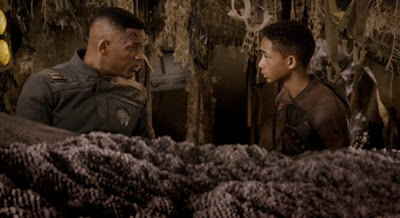 After Earth, after all, is a vehicle Will Smith has mounted for his son, Jaden. Papa Smith gets a “story by” credit, and largely takes a backseat to his offspring/ Pursuit of Happyness co-star when the meat of the After Earth story hits the burner. Before you go screaming “Nepotism,” however, Jaden once again proves himself a capable leading man. He’s less charismatic here than he was in both Happyness and his enjoyable Karate Kid remake, but he’s playing down the in-his-genes Smith personality because it serves the story. What is the story, exactly? Will Smith and screenwriter Gary Whitta have concocted a survival tale set in a distant future, where Cypher Raige (Will Smith) stands tall as society’s bravest warrior. Raige has mastered the art of “ghosting,” a technique of masking one’s fear to escape the sight of The Ursas, a vicious alien that senses through fear pheromones. Cypher’s young son, Kitai (Jaden Smith), is training in the same program that his father has mastered, though he’s swallowed up in his stoic father’s shadow. Simultaneously, the family is haunted by a death in their family, a dark moment when an Ursa claimed Kitai’s sister, Senshi (Zoe Kravitz). Hoping to establish a bond with his son, Cypher takes him on a mission. During the trip, their craft is caught in an asteroid storm and forced to land on the closest planet. Unfortunately for them, the planet is an uninhabitable Earth, which mankind destroyed eons ago. The Future Earth more closely resembles prehistoric times than the Neo Seoul of a Cloud Atlas, or the dingy Day-Glo future of Sir Ridley Scott’s Blade Runner. After Earth is set in a desolate landscape that’s brimming with dangers that threaten to prevent our hero from completing his task. After Earth calls to mind Shyamalan’s The Last Airbender, only it’s an improvement because the director learned from that film’s mistakes. 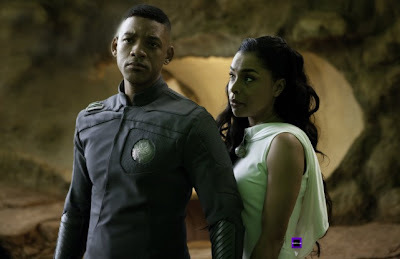 There’s a rich backstory available in After Earth – and even a novelization that reportedly goes into greater detail if audience members are interested in learning more – but Shyamalan doesn’t get lost exploring it as he did in Airbender. The sci-fi production values are excellent, and the action – while intense in spots – is always cognizant of the teenaged hero and the young audiences who might be rooting him on. After Earth might be dismissed as too basic by savvy sci-fi crowds, but it can be an exhilarating ride for young moviegoers interested in interplanetary adventures, but impatient with the dense layering of the genre. Don’t enter After Earth expecting to see Smith reprise his Independence Day role, though. The actor channels a solemn Laurence Fishburne to play Cypher, a mentor figure hoping his son can recognize his full potential. Jaden, perhaps playing to the screenplay, presents Kitai as an intuitive, sensitive boy struggling to find his identity. In many ways, Kitai is a true Shyamalan protagonist: quiet; confused; curious; emotional; and in tune with nature. The movie falls into that subdued atmosphere, which is fine, but unexpected for a large-budget, Big-Willie-Style blockbuster. 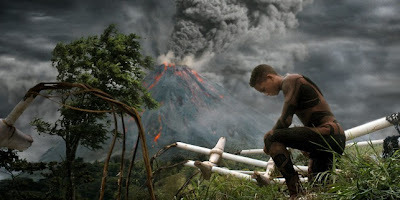 The approach to the material and the lack of a breathtaking set piece makes After Earth an odd summer selection in general. The energies of Will Smith and M Night Shyamalan are so different that their unusual pairing almost grounds their collaboration in stasis, but once you readjust your expectations and accept After Earth on its own terms, I think you’ll find it’s an admirable YA adventure, a moderately engaging piece of sci-fi storytelling, a return to respectability for Shyamalan, and a welcome departure for an aging Will Smith.